Hootie & The Blowfish is a rock band which formed in 1986 in Columbia, South Carolina, United States at the University of South Carolina. The band consists of Darius Rucker (vocals, guitar), Mark Bryan (guitar, vocals), Dean Felber (bass, keyboards) and Jim Sonefeld (drums). The band has released five albums, "Cracked Rear View" (1994), "Fairweather Johnson" (1996), "Musical Chairs" (1998), "Hootie & The Blowfish" (2003) and "Looking for Lucky" (2005). Their debut album Cracked Rear View" is currently the 15th best selling album of all time in the United States, and was for several years the best selling debut album of all time. 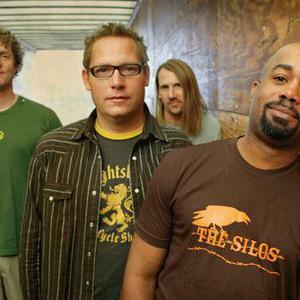 Hootie & the Blowfish formed in 1986. The quartet met when they were freshmen at the University of South Carolina in Columbia. Bryan heard Rucker singing in the showers of the dorm they shared and was impressed by his vocal ability. They began playing cover tunes as The Wolf Brothers; eventually they collaborated with Felber, a former high school bandmate of Bryan's, and Jim "Soni" Sonefeld as Hootie & the Blowfish. Brantley Smith was the original drummer for the band. He left the group to pursue music ministry, but he has made scattered guest appearances with the band (he played cello on their MTV Unplugged performance in 1996, and played drums at Gruene Hall in Gruene, Texas, on June 27, 2008). The group independently released two cassette demo EPs in 1991 and 1992. In 1993, they pressed 50,000 copies of a self-released EP, Kootchypop. Their mainstream debut album was Cracked Rear View (1994). It was an instant success, ultimately going platinum 16 times in the U.S. and becoming the best-selling album of 1995. The album was propelled by four hits, "Hold My Hand" (U.S. #10), "Let Her Cry" (U.S. #9), "Only Wanna Be with You" (U.S. #6), and "Time" (U.S. #14). Miami Dolphins' Hall of Fame quarterback Dan Marino appeared in the band's video for the song "Only Wanna Be with You", along with several other athletes. The band won the "Best New Artist" award at the 1996 Grammy Awards. Hootie & the Blowfish appeared on MTV Unplugged on the eve of the release of their second album, 1996's Fairweather Johnson. Though sales began promisingly, and it contained the hit single "Old Man and Me" (U.S. #13), the album sold four million copies in the U.S. In 1995, Hootie & the Blowfish contributed the song "Hey Hey What Can I Do" to the Encomium tribute album to Led Zeppelin. Their cover of Canadian group 54-40's "I Go Blind", originally released on the soundtrack to the TV series Friends in 1995, did not appear on Cracked Rear View or Fairweather Johnson, but nevertheless became a hit at radio in 1996 after three singles from Fairweather Johnson had been released. Both "Hey Hey What Can I Do" and "I Go Blind" were later released on the collection Scattered, Smothered and Covered. Hootie and the Blowfish started their own record label, Breaking Records, in 1996 as a subsidiary of Atlantic. They had planned to focus on signing local Carolina acts. Edwin McCain and Cravin' Melon were both associated with the label at one point, but did not release any material on it. Meat Puppets, Jump, Little Children, Treadmill Trackstar and Treehouse released one album each on Breaking Records. The label folded in 2000. In 1998, they performed on Frank Wildhorn's concept album of the musical The Civil War. In 200, the band released a B-sides and rarities compilation in 2000 entitled Scattered, Smothered and Covered. The band covered the 1968 Orpheus hit "Can't Find the Time" in 2001 for the soundtrack of the Jim Carrey movie, Me, Myself and Irene. Orpheus leader Bruce Arnold performed the song with the band during several concerts on the West Coast of the United States in 2001. In 2009, Hootie and the Blowfish performed live in a ballet which chronicled their rise and success in the 1990s. In 2008, Rucker announced in an AOL Sessions interview that Hootie and the Blowfish would be going on hiatus so Rucker could pursue his solo career as a country music performer. Although the band will no longer be recording or touring, Rucker confirmed that they will still perform their scheduled charity concerts, stating, "We have four charity gigs every year and we will still do them, but we will not do a record or tour." Rucker also said that the split will last "for five or six years, or until I record three or four country albums". He later amended his statement, saying, "To be honest with you, we're not even split up right now, and we're not really thinking about splitting up."